Below is a graph I didn't include in my more recent post because it doesn't span as long a period of time. 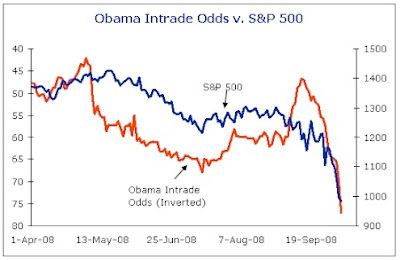 But this chart has inverted Obama's intrade odds during the campaign and compared them to the S&P 500 during the same time period. Again, this isn't to suggest that the "economy" is Obama's fault. Certainly the markets have experienced rises and falls independent of him before and will continue to do so. What this does show, however, is that there was a correlation between the stocks at this specific point in time and his polling numbers. This shouldn't be surprising to anyone. When a candidate promises to raise our capital gains tax (when we already have the second highest in the world), traders are going to sell their stock when it became increasingly apparent that this candidate is going to win the election. In addition, Obama Opposes/ opposed free trade agreements and wants/ wanted to re-negotiate NAFTA—the same anti-free-trade approach that helped start the Great Depression (in addition to Hoover's brilliant idea to raise taxes). Thus, as Obama's numbers improved, more people sold their shares. When he had a lull in the polls, markets bounced back on false hope that McCain might rally. This isn't a difficult concept to grasp. But again, this connection is not my creation. I wasn't the first to notice it, and I won't be the last. NRO covered it nearly a week before me (with an admittedly different take). That doesn't mean the topic isn't worth discussing, or that no one but the individual who first noticed a potential Obama/stock market connection gets to write about it. Now, like the religiosity issue, we have a chicken/egg scenario. Did the markets fall because Obama's chances of getting elected were going up? Or did Obama's chances of getting elected go up because the markets went down under a Republican president's watch? Most people, at the time this was taking place, suggested that Obama's numbers were following the markets. Yet, Novermber 5th and 6th brought the largest market sell-off ever of any presidential election, even though the current recession had yet to reach the severity of even the 1980s recession. His inauguration day also experienced the worst sell-off of any inauguration before it. Then the markets plunged both in direct result to his "stimulus" bill getting passed and Geithner's proposed spending bill getting announced. This suggests that Obama has lead, not followed, declines in the market. Does that mean that markets haven't or won't dip and rise irrespective of Obama's actions? Of course not. Any number of things can effect the market. But if you don't understand how the agenda of a president can effect the markets, you need to put a helmet on. Does that mean Obama's to blame for the recession? Of course not. The recession officially started in December 2007. He was campaigning at the time, but he didn't win his party's nomination until 6 months later. It is significant to note, however, that the Dow Jones has done nothing but drop since the last day of the Democratic national Convention (August 28th). As they say, "it's been all down hill since then." Does all of this suggest that Obama may have made the recession worse than it otherwise may have been? Yes, I believe it does. What started the recession? The housing market bubble burst. What caused the market bubble to form in the first place? First, the CRA and then loan deregulation which took place primarily under the Clinton administration (remember, McCain stood before the Senate several years ago and said that the housing market needed to be regulated - but he was denied by Democrats and a few Republicans). What caused the bubble to burst? Well, it's the nature of a bubble to build up to a certain tipping point and then burst. No matter who's watch it burst under, it was inevitably going to burst unless dramatic changes were made - and no administration has moved in the right direction with the housing market since the 1979. But, I don't think it's a coincidence that the recession officially started after the democrats took over congress. Similarly, I don't think it's a coincidence that unemployment began to dramatically rise and the markets began to dramatically fall after the democrats took over congress. Just as it isn't a coincidence that share holders sold, sold, sold after Obama's election and inauguration. Each of these instances, unto themselves, might well be disregarded as mere coincidental correlation. But when added all together, you have a trend which speaks to causation - perhaps the strongest quantitative trend derivable at this point in time. Is this causal link 100% finitely error-proof? No, what is when talking about this complex of an issue? Wall Street doesn't like regulation and increased taxation. Why it's so hard for some liberals to grasp the concept that the markets would respond poorly to the high-polling, election, inauguration and policies of a president who has specifically said he wants more regulation and increased corporate and capital gains taxes, is beyond me. Not to mention that fact that Obama got elected by bad-mouthing the status-quo, to include the state of the economy. As the Wall Street Journal's Bradley Schiller suggests, Obama's rhetoric is the real 'catastrophe'. Look at it this way: You're a wealthy stock holder. You pay roughly 40% of your gains from the stock exchange in taxes. There's a man running for election who has promised to increase that tax rate and, therefore, decrease your profits. When his polls go up, would you be more inclined to sell or buy? When he gets elected, would you be more inclined to sell or buy? When he's officially inaugurated, would you be more inclined to sell or buy? When he actually proposes plans which will skyrocket the national deficit and debt, decrease the worth of the US dollar but do very little to stabilize the loan markets, would you be more inclined to sell or buy? When your president continues to go on national television and inaccurately say the economy is the worst it has been since the great depression, would you be more inclined to sell or buy? When you think about it like this, it's not hard to understand why the markets have reacted negatively in direct response to Obama and his interventionist, bottom-up agenda and negative rhetoric. Good analysis here Seth. I agree that Obama's "talking down" the economy has pushed the market (and people's hopes) down. The biggest bubble in the histroy of bubbles is not his doing. It was created by the Four Riders of the Hypocalyspe, and greenspan was on the second horse. (Bush and Clinton were both complicit.) But Obama's role of destroyer will be related to the recovery. Normally historic cycles show that for a recession of this magnitude a recovery will begin 1-1/2 to 2yrs after it started. That puts us towards the tail end of 2009. But... and a BIG but here -- since Obama's Blitzkrieg of Socialism will continue unabated, that normal cycle is likely to be extended and the depth to which the economy will sink will be greater than without those countercyclical fiscal policies.